Mestre Pequenina, Congresswoman Pérpetua Almeida and irmandade (brotherhood) of the União do Vegetal in front of the National Congress (Brasília-DF – Brazil, July 11 2011). The use of the Hoasca Tea within a religious context is fully authorized and has been recognized by Brazilian authorities since 1987, as it is proven harmless to the health. This fact gives peace of mind to the disciples of the Beneficent Spiritist Center União do Vegetal and other religions that commune with the Tea. It has also set institutional and legal precedence, allowing the UDV to grow in a continuous, sustained manner in Brazil and abroad. That recognition from the authorities is the result of the major effort that the União do Vegetal had in defending its right to the religious use of the Hoasca Tea. This work began in 1965 when the founder of the religion, Mestre Gabriel, along with his family, moved to Porto Velho – Rondônia (Brazil), starting the institutional organization of what would soon become the Beneficent Spiritist Center União do Vegetal. In the second half of the 1960’s, and in the 1970’s, the effort of the União do Vegetal was concentrated towards the authorities of the former Federal Territory of Rondônia. In the 1980’s, the work was extended towards the federal authorities with the transferal of the UDV’s headquarters to Brasília-DF (Brazil). From the first years of the 1990’s to the present, these efforts expanded even more, reaching the authorities of other countries where the União do Vegetal is present. In 1991, the main religious organizations that use the Hoasca Tea gathered in Rio Branco – Acre (Brazil) with the common objective of having its use regulated. A Letter of Principles was written as the result of that meeting, which included ethical procedures for the responsible use of the Tea as a religious sacrament. The Brazilian authorities supported the initiative. In 2004, the Brazilian government instituted a multidisciplinary work group to assess and observe the religious use of the Tea, as well as to research its therapeutic utilization. They also created a national register of all institutions that adopt its religious use. That group was composed by representatives of the religious organizations that signed the Letter of Principles in 1991, in addition to members of the academic community and the government. It had as president a member of the government, and had Mestre Edson Lodi Campos Soares, the representative of the União do Vegetal, as the vice-president. In January 2010, the Brazilian government issued a resolution that fully accepted the final report of the aforementioned work group. The document consolidated the procedures that were established within the Letter of Principles that was signed in Rio Branco. The report asserts that the religious use of the Hoasca Tea is incompatible with the association with unlawful psychoactive substances. In addition, it is incompatible with the commercialization of the Tea, with religious tourism, therapeutic use and the advertisement of its effects. The document also suggests measures to restrain its non-ritual use among many other arrangements and deliberations. 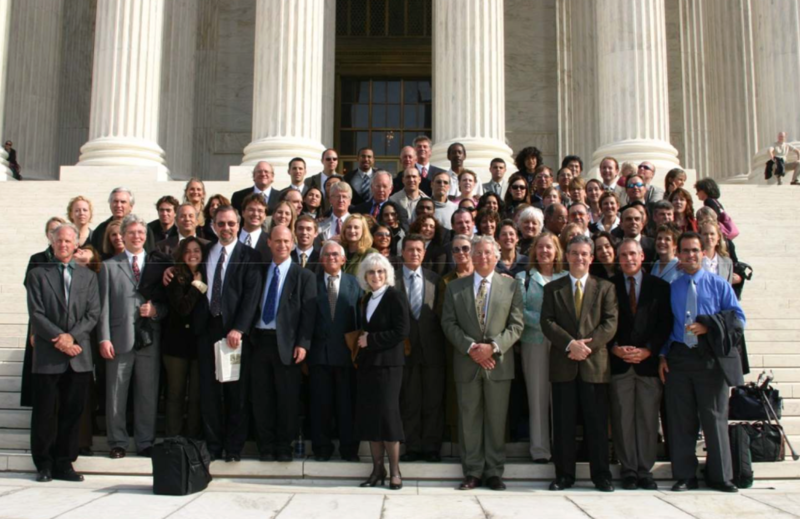 Members of União do Vegetal in front of U.S. Supreme Court after the hearing (Washington-DC, November 1, 2005. In 2006, in a historical and unanimous decision, the U.S. Supreme Court allowed the religious use of the Hoasca Tea in the United States. This was an important step to the international recognition of União do Vegetal, opening a path to be followed by the authorities of other countries where the UDV is present. This victory was achieved after a long judicial dispute between the União do Vegetal and the government of the United States. In May 21 1999, in the city of Santa Fe, New Mexico, U.S. Customs agents seized a container of Hoasca Tea, used exclusively by Núcleo Santa Fé (first community of the União do Vegetal in that country). For a period of 18 months, all efforts were made to negotiate the return of the container that was apprehended. With the unsuccessful efforts of liberation of the Tea, and running a risk of indictment, the UDV filed a lawsuit in the federal U.S. court requesting the recognition, in its entirety, of the right of its members to commune the Hoasca Tea in their religious rituals. In 2001, the Judge of United States District Court, granted a Preliminary Injunction enjoining the United States Government from further interfering. The United States government appealed that and other subsequent decisions that were in favor of the União do Vegetal. In 2004, the government defendants appealed to the U.S. Supreme Court. 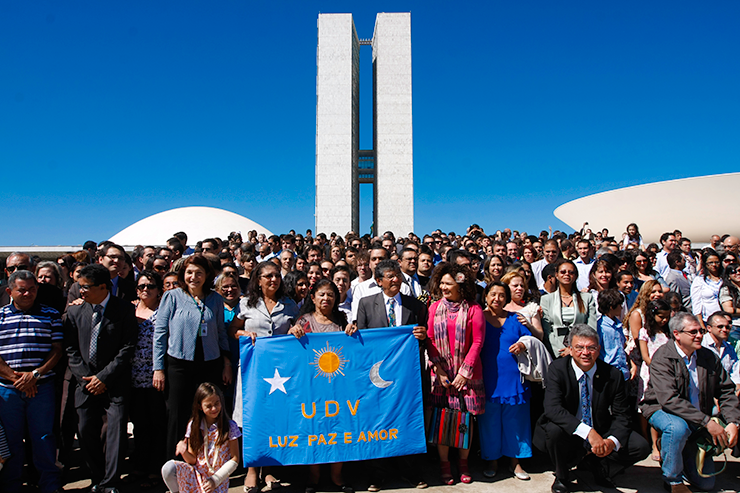 After almost six years, on November 1, 2005 – a consecrated day in the religious tradition of the UDV – the U.S. Supreme Court held a case hearing on the subject, reaching a unanimous and final decision on February 21, 2006, affirming the União do Vegetal’s right to have the lawful exercise of its activities in the United States. Today, in a gradual manner that is expanding its spiritualist doctrine, the UDV is present in seven American states: Colorado, California, New Mexico, Florida, Washington, Texas and Hawaii.